In the lead up to Christmas, I have two different styles. It's either a subtle "little bit Christmassy" or "FULL ON DECK THE HALLS OH MY GOD IT'S CHRISTMAAAAAAS". There is absolutely no in-between. This outfit is leaning more towards the first (although don't worry, there's another post this week which is head to toe penguin print! 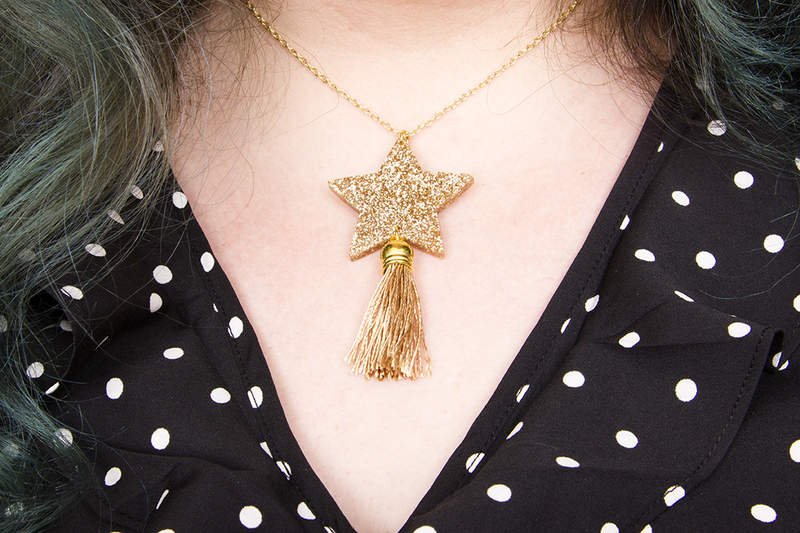 ), and is an easy way to take you from day job to festive fun with a few cute accessories. I'm a huge fan of jewellery brand Sugar & Vice and immediately fell in love with their Christmas range the second it dropped. 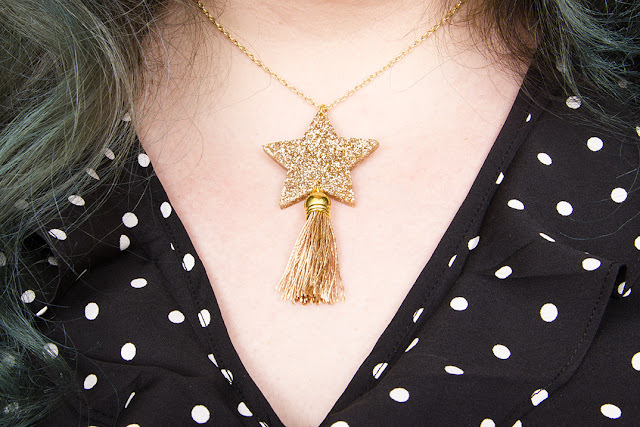 I picked up this Shooting Star necklace as a gift for one of my friends, and adored it so much when it arrived that I had to go back and buy a second one for myself! It's the perfect way to make a simple outfit instantly festive, and went so well with the neckline of this New Look Curves Polka Dot Dress. To finish it off I teamed some cute F&F Christmas Lights Socks with my trusty Heavenly Soles Glitter Court Shoes Extra Wide EEE Fit from Simply Be and absolutely felt ready to get up to snow good! Don't forget you can also score a one time 15% off your Sugar & Vice order with the code "grungekitty" at checkout too, so you might want to treat yourself as well as your friends and family! 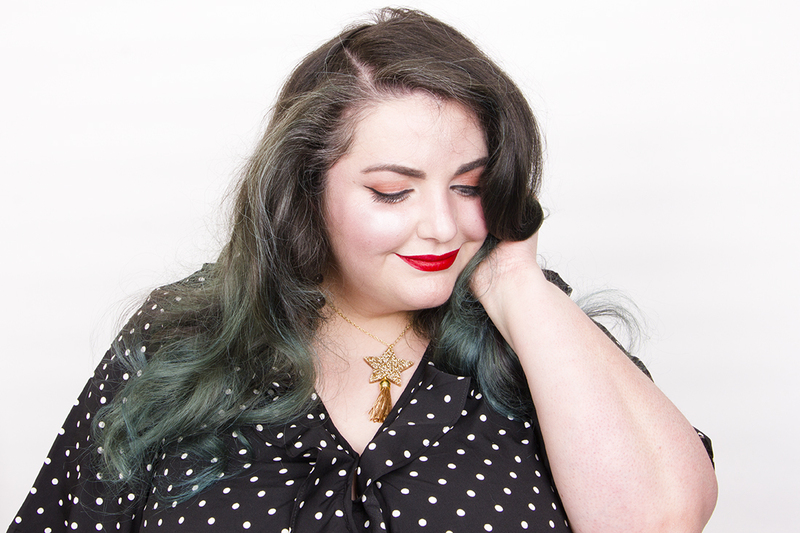 I’m so glad this look has finally made it to the blog because it’s so cute. That dress is perfect on you! And that necklace. And those socks. All of it! I love this look SO much! The dress is fantastic and really suits your figure and those socks are EVERYTHING!!! This is such a cute look, love the polka dot dress and that necklace is gorgeous!